My father used to read the poem Annabel Lee to me. Even when I was too small to understand the context, I could tell by the words and my father's mournful delivery that it was a tragic tale. A haunting tale. An ode filled with sorrow. It is my favorite poem. Although dark and tragic and about death, it is a wonderful example of literary Romanticism, for which Poe is known for. Romanticism was an artistic movement in the 18th and 19th Century that had more of a spiritual attitude than artforms preceding it. This genre tended to move away from, and question realism, convention and "rational thought" and gravitate to nature and sentimental reflection, especially the topic of the artist alone with nature. I picture the scene in Pride and Prejudice when Lizzie stands on the cliff with the wind blowing her skirt as an example. 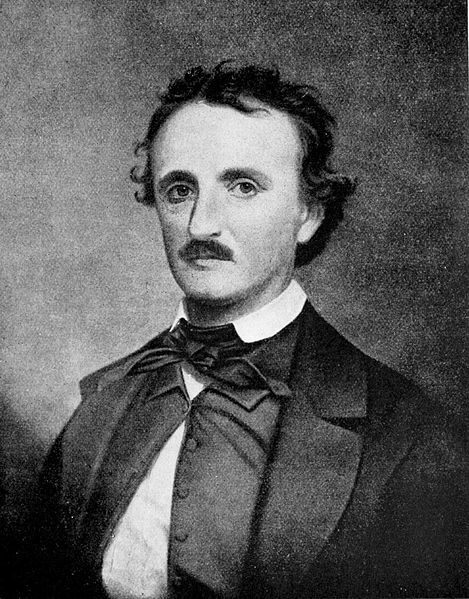 In the poem Annabel Lee, Poe or the narrator if you prefer, states that he and his bride lived in a "kingdom by the sea." When two people are in love, any home would be their realm and this line sets the tone for a storybook mood. Also, it reflects their insular setting with nature. He refers to Annabel Lee as a maiden, which some speculate to literally mean virgin, but I feel that again it is a word that goes back to a romantic era and goes hand in hand with a "kingdom." These choices lend themselves well to the style of Romanticism. By referring to themselves as children he gives a clue to their innocence. They have no cares except to love each other unburdened by anything else in life. The fact that even the angels are jealous of their love has always been the most powerful part of this poem for me. Angels, who are supposed to be the most elevated and pure beings cannot bear the feelings of Annabel Lee and her true love as it even surpasses their reach. Perhaps he means this literally or perhaps in his grief he rationalizes that this could be the only explanation for her death. Even after death it seems that the narrator's love will never wane, his feelings as strong as ever. Their love is frozen in time and entombed just like his bride and nothing, not time nor death can diminish their emotions. The poem is further more real because it is written in first person and the reader truly feels the despair and desolation, another style that Poe is known for as well as for his strong, deep and dark emotions. What a wonderful post! I have been wanting to dig into my Poe book lately, this makes me want to more! What a great memory to have with your father! I love this poem! There is a musical version that I listen to all the time! It's by Sarah Jarosz and it is so freaking good! @Kimba-Thank you for stopping by. I didn't realize the specialness of the memory until so much later in life. @Lost-I know what you mean! I miss reading Poe. @Kimberly-I didn't know there was one in VA. But I visited the one in Baltimore and we have one up here in the Bronx. @Steph-I am going to look that up in ITunes. Thanks! @DarkEva-I am totally obsessed, but wish I was a little more learned on his works and his life. Annabel Lee is such a gorgeous poem, and I love that your dad used to read it to you. Someday you need to visit us down here in Richmond and we'll take you to the Poe museum!